I know its a bad pun - but these are good mittens! I finished the fetching mittens using a single ball of Cashmerino Aran (as called for in the pattern). The pattern warns that you will have less than a yard left, in fact I had about 4"remaining, and only because I did 2 fewer rows on the hand than called for. 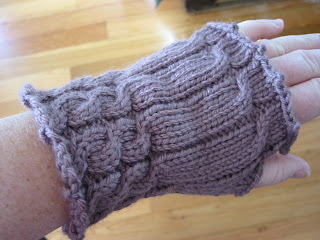 However, the pattern is really quick to knit and the mittens are cute, and the cashmerino aran works really well. 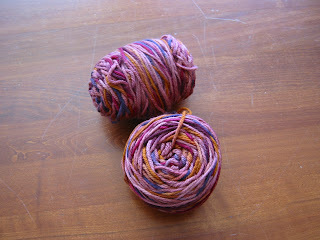 So, I immediately cast on another pair - this time in the knitpicks bare that I dyed with Kool-aid. I think I'm going to give these mittens to my neighbour who admired my green mittens (big mistake for her! Ha ha...you like these green mittens? let me give you some completely different in purple). Looking at this photo I am astonished that I do not have a highly lucrative as a hand model...now added to the little fat hands with fingers like sausages I seem to have wrinkly wrists with age spots. I finished the felted clogs. Here they are before felting (little fat foot for scale). 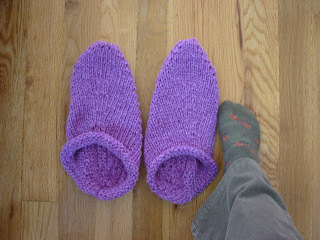 Here they are after felting - photo by my assistant photographer of feet: Adam. 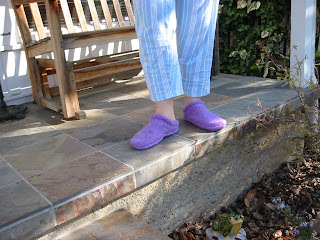 They are very comfy but very slippy on my wood floors. They have been offered to Gill who has carpets! I didnt much enjoy knitting the pattern, as I dont much like knitting on large needles but since they worked out so well I may knit some more. Another part of the knitting plan was to knit up this Jaegar Como. I cast on to knit the Hip Hop coat from IK but Im not really happy with it. The yarn is 90% merino and 10% polyamid and is not plied - this gives the knitted fabric the effect of being 100% man made. The knitted fabric is also extremely lightweight - which I had originally thought would be good for a coat - but Im really not liking either the process of knitting this yarn, or the product. Time to put it away and let it marinate for a while. 1. Knit the felted clogs - if they work well, knit more out of the pile of non-superwash Cascade I bought in a misguided moment. 2. Socks - got yarn for socks in my stash that I should start knitting up, mostly its pretty unexciting wool though which is why it's been languishing. I plan to knit some plain socks for Nigel, and he has also asked for cotton socks. 3. 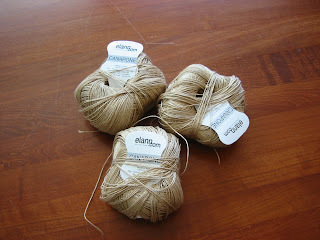 Ive got some Elann Canapone hemp yarn - I bought this to knit a shawl, I am wavering between knitting something like Icarus, or River. I think the Icarus would look nicer, but River might be more useful. The only disadvantage is that the River I already knitted is in the same sort of neutral colour. Maybe my mother would like it? Must remember to ask...and of course, got to knit it first. 4. Ive been sitting on this bag of Como for a year - I think it needs to become a sleeveless jacket. I want a long knitted cardigan/coat, but probably not in bright orange. Looking for a pattern for this. 5. 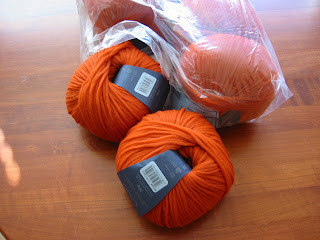 I want to knit some Fetching mittens and I have a ball of Cashmerino aran. If the pattern is nice to knit I can see me knitting more than one pair. 6. Christina and I are planning a knitalong for the IK Swallowtail shawl, and I already have the Misti alpaca that the pattern calls for. No reason not to do this - apart from I'm already overloaded with shawls, however pretty. Maybe this would be a nice thing to knit for Eileen? 7. I just bought some Elsebeth Lavold silky wool to knit the cabled cardigan in Vogue Knitting this month. Its the only pattern in the entire magazine that I like, but it calls for a 100% cashmere yarn...I like silky wool so I'm hoping it will be a good substitute. Little cardigans are actually knitwear that I will wear a lot. 8. Got 800 yards of this linen/cotton mix, probably be a summer top for me. 9. Got to knit something out of the stuff I dyed - maybe mittens - but again, if I dont do it soon will not be needing mittens for a while. 10. 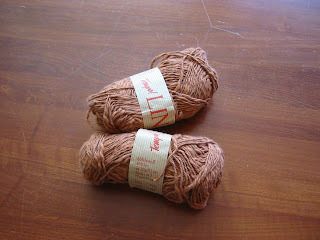 I bought a nice pattern for a lacy scarf - Ive got some nice yarn that would work for it - but cant decide which. 11. Been sitting on this Artyarns Supermerino for a year (was supposed to be my tank top but I did that in Shepherd Sport in the end. Not sure what to knit it into - Ive about 600 yards so not enough for a sweater. Maybe another clapotis? I wear the Noro one enough. 12. 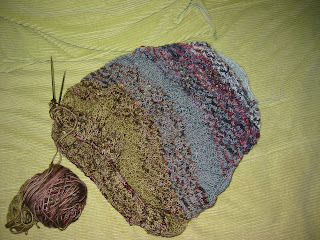 Got some Malabrigo to knit into a hat for me, again, if I dont do it soon, wont be worth it until next fall. So, I have enough plans to keep me knitting for the forseeeable future. Several of these plans are small-scale though so should be able to get through quite a few. Stitches West is coming soon and although I dont have huge shopping plans I'm hoping to pick up some more STR. I didn't buy much last year but it was nice to see what was available and get some inspiration, although it does not look as if I need any more ideas of what to knit...just some actual knitting. 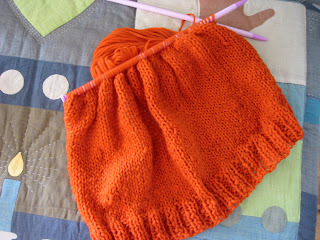 Immediate next thing on the needles is going to be a camera case for Adam, and that has not even made it onto the list! 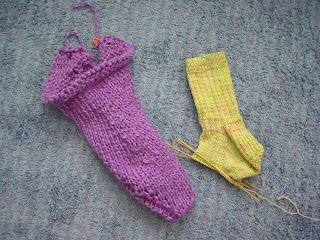 Here are my current works in progress: On the left a felted clog from the fibretrends pattern. On the right a sock for me. Its a k3 p1 rib in Peace Fleece wool in colour Waterlily. The wool is lovely and soft but I was disappointed to read its hand-wash only - after I wound the ball. I should have made gloves really - but too late now. These are Jelly Wigglers (or jello wigglers if you are american). Adam saw the idea in his Pixar Annual and wanted to make them...nutritional value=0, entertainment value 10/10, especially when Adam had a tantrum when the eyes fell off his wiggler! 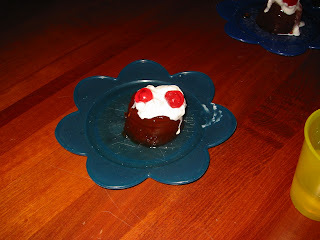 Next day I substituted raisins for the cherries and the eyes didnt fall off. I finished my Charlotte's Web shawl. I didnt add the fringe as I felt it made the shawl too 'old lady' - you might say that any shawl is 'old lady' enough with or without fringe - but I'm happy with it. The pattern calls for 5 skeins of koigu varigated yarn. This shawl is knitted in 3 semi-solid koigu kppm (the light and mid blue, and the green), the blue/purple variagated is Claudia's handpainted, and the brown is Collinette jitterbug. Other than substituting the yarn and ommitting the fringe, I followed the pattern. I dont think I will overdye the blue, now the shawl is completed and blocked, the light blue does not look so incongruous. It was a really nice knit, the lace pattern was simple and memorable and the colour changes kept me interested in the pattern. 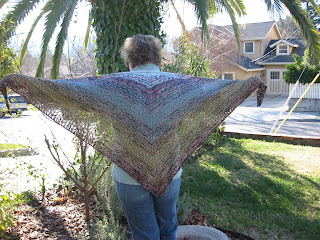 The shawl is nice and large, and I hope will be robust enough so I dont need to worry about catching it on things. This is my new knitting bag, courtesy of guess who?. The photo does not show the lovely lining, or the detail of the decoration on the front. My fab new bag is currently housing Charlotte's Web. 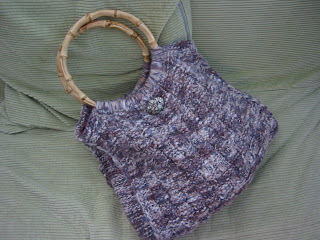 Its a koigu design, intended to be worked in 5 variegated yarns. I wanted a shawl in blue and brown but could not find enough variegated yarn in those colours, so I have the semi-solid blues and green. I dont mind the striping too much, but Im not sure about the lightest blue. The lightest blue does not really show in this photo, its the smallest colour range, but its so much lighter than the other colours it does not really blend as well as I had hoped. Kerstin suggested dipping this secti0n of the shawl in tea, so once I have finished the knitting I may do some experimenting. The last colour is the brown variegated yarn in the ball, it is the largest band of colour and may change the appearance of the overall shawl enough that I dont care about the light blue. Charlotte's web is very appropriate at the moment as I went with Adam's class to see a theatre production of this childrens classic at the Santa Clara University Theatre. It was a lovely version, only an hour long, and really seemed to capture the childrens attention. I did mention Christmas knitting received- these fellows were actually sent to the boys, but have been appropriated by Nigel and I. The outfits were of course made by Christina. 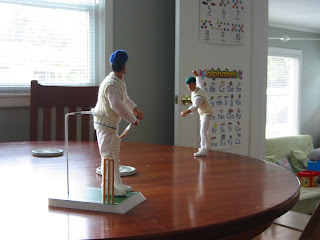 In addition the action men also received football strips and some manly sweaters, hats, scarves, and mittens. 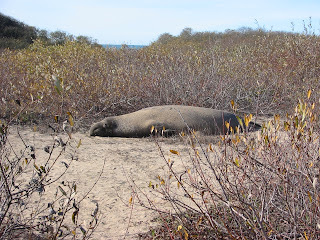 On Friday we went to Ano Nuevo State park to see the Elephant seals. It was a lovely bright day and we saw lots of seals, including several pups. We also witnessed a small amount of male-seal posturing which was quite frightening as they were pretty close to us and moving faster than you might expect. 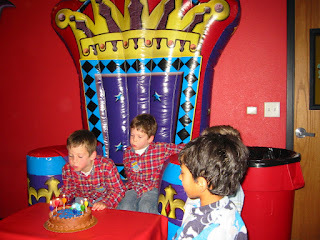 The walk is about 2.5 hours and the boys did really well both walking and listening to the docent. So, a lovely end to 2006. Wishing you a Happy New Year for 2007.